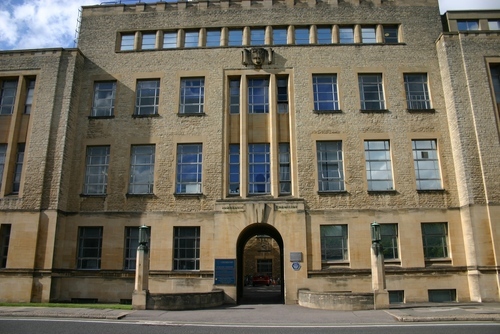 This is the main facade of the Inorganic Chemistry Laboratory of the University of Oxford (South Parks Road). 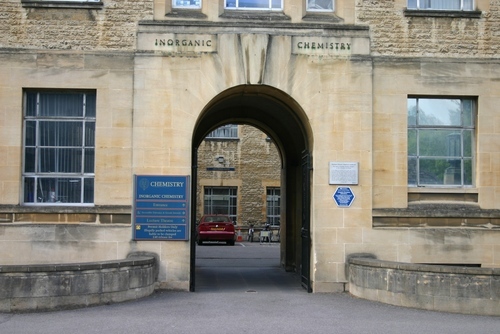 "The earliest periods of the development of a university chemistry school at Oxford are not easily unravelled from the simultaneous development of schools in physics and biochemistry. Chemistry was seen to be a truly separate discipline with the building of its own laboratory as an appendix to the Science Museum which opened in 1860. The laboratory stood and still stands as a remarkable small octagonal structure beside the museum, built in Victorian Gothic style deliberately designed on the Abbot's kitchen at Glastonbury. The building, one of the first purpose built chemical laboratories anywhere, is still called the Abbot's Kitchen. The laboratory was extended, still in Gothic style, in 1878 and a further major extension to add three wings was completed in 1957. 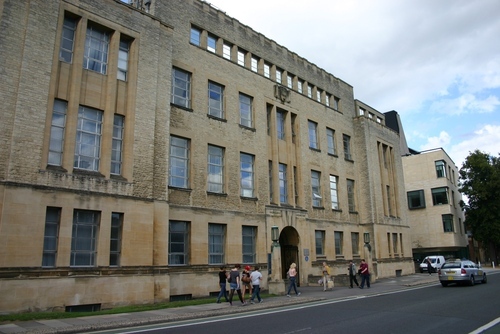 The main Inorganic Chemistry Laboratory now comprises five floors of laboratories, workshops, offices and seminar rooms as well as occupying the whole of 9 Parks Road (the Chemical Crystallography Laboratory) and a substantial portion of the New Chemistry Laboratory in South Parks Road. It is the biggest school of inorganic chemistry in the UK and one of the biggest in the world"1. 1. Retrieved from the Department's official website.